Classic Tweed and then some! Great kit for beginners and pros alike, and a great platform for trying out modifications and alterations to this classic circuit. Gave me a great place to start on my own amp ideas based around the 5E3, without breaking the bank. I also love the ability to have certain components not included, so I could do my own upgrades where needed. Makes it easier for the builder to customize, without buying double the parts. And of course, the 12A125A, and gorgious cab (I got mine in black tweed/british tan cane combo with a brown dogbone handle, a color scheme I like to call Macchiato) are second to none, both in quality and in tone. I’m sure this won’t be the last kit I build from Weber! I’ve built a few amps previously from scratch. This was my first kit build. I used all the supplied parts, and it worked fine on initial power up. I think it sounds great, though I have no previous experience with the 5e3 to compare it with. On the advise of others, I will probably try replacing the tone caps with some of better quality, and change to JJ tubes. Will also try replacing the copper cap with a 5Y3 rectifier tube. And probably replace pots with something better. I should have gone this route from the beginning to save myself some time, but I was curious how the different components compare. I think the speaker sounds great. Great clean tones at lower volumes, beautiful overdriven tones as you turn up the volume. Lots of different tones available for just 3 controls. You have to play with it - the 3 controls interact. Great platform for learning about tube amps. Many modifications can be done to this amp, though certainly not required. 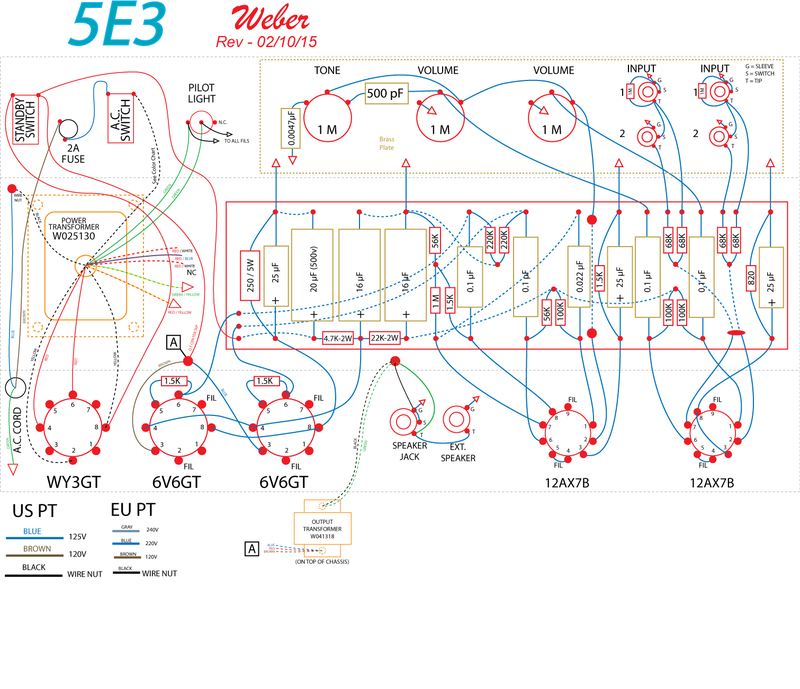 Check out Rob Robinette’s website for lots of info about the 5e3. TAKE YOUR TIME AND PAY ATTENTION TO LEAD DRESS. I would buy this Weber kit again. What a great little amp! This amp was a learning experience for me. I had built other kits but came up against some issues. 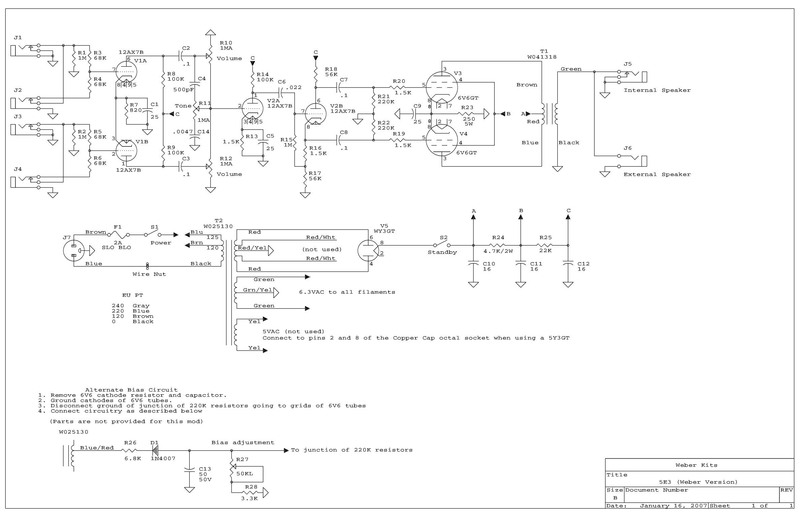 First- this circuit has the characteristic of interaction between the two channels because of the shared tone control. I found a circuit that used a double tone pot and a few parts to isolate the channels successfully. Second- the screen supply resistor is under-rated and susceptible to burning out. At first, I just replaced with a 5W resistor. Later decided to replace the resistor with a choke. After some research, I learned that Leo added 470 Ohm screen resistors on later amps to improve reliability, so I did that. The tone appeared to not change but no more tube failures. I finished off the tweed with Minwax satin Honey Pine urethane.